The Invasion Begins Christmas Day. 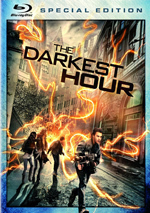 An action thriller featuring mind-blowing special effects from the minds of visionary filmmaker Timur Bekmambetov and director Chris Gorak, The Darkest Hour is the story of five young people who find themselves stranded in Moscow, fighting to survive in the wake of a devastating alien attack. $3 million on 2324 screens. From the “it looked awesome based on the trailer!” file comes 2011’s box office disappointment The Darkest Hour. Young software designers Sean (Emile Hirsch) and Ben (Max Minghella) fly to Moscow to help grow their business. Unfortunately, they arrive to find their ideas stolen, so this doesn’t go well. Sean and Ben hit the Moscow nightlife to drown their sorrows and meet hot Russian girls. They do encounter some babes, but they’re American Natalie (Olivia Thirlby) and her Australian pal Anne (Rachael Taylor). As the quartet parties, the power goes out and a weird formation appears above Moscow. Strange energy balls come down to earth – and promptly devour the humans with whom they come into contact. Panic ensues, and it appears that a full-on alien invasion is afoot. Our lead characters – and Skyler (Joel Kinnaman), the Swede who pilfered the boys’ business plan - attempt to survive this onslaught. 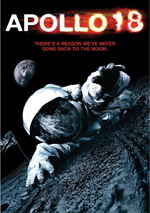 I admit that I love good – and sometimes not so good - alien invasion action flicks. I continue to defend 1996’s Independence Day and I liked 2005’s War of the Worlds, among others. Recent years haven’t been as kind to the genre, however. 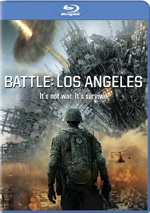 The Transformers movies have been pretty poor, and 2011’s Battle: Los Angeles was a messy dud. I hoped that Darkest Hour would offer a rebound for the genre, but that doesn’t happen. While it never becomes a genuinely bad film, it seems stale and without much inventiveness. It launches in a traditional way and never manages to do much to depart from the War of the Worlds/Independence Day template. Actually, that’s not wholly true, as Hour often plays more like a horror film than those others do. I suspect that’s a by-product of its modest budget; with only a meager-by-today’s-standards $30 million at its disposal, the movie couldn’t invest in prolonged, effects-heavy action sequences. That leaves it with an often-invisible villain and more stalking/sneak attacks than real action. That could be fine, I guess, but in this case, it doesn’t lead to a particularly interesting story. For much of the movie’s running time, we’re stuck with characters who simply skulk around and hide. Yes, they eventually find a way to fight back, but it’s too little, too late, as even those sequences lacks the sizzle to make them exciting. Essentially the film delivers a big bag of clichés all packed into one place without much fresh to enliven it. We find consistently flat characters, and we can easily predict who will and won’t survive. (Shades of the horror flick model!) Heck, the movie doesn’t even deliver a particularly satisfying ending; when Hour concludes, it leaves us with the feeling it was little more than a sketchy teaser to launch a hoped-for franchise. Given the film’s lackluster box office, I doubt that a Darkest Hour series of films will come to fruition, and I can’t say that I’ll bemoan the lack of a sequel. The Darkest Hour comes as part of a genre I enjoy, but it does too little with its story and subject to prosper. While never a poor movie, it ends up as a derivative and forgettable one. The Darkest Hour appears in an aspect ratio of approximately 2.40:1 on this Blu-Ray Disc. This wasn’t a bad presentation, but it lacked the “dazzle factor” I expect from Blu-ray. Sharpness was a moderate weak link. Though much of the movie showed decent to good clarity, it lacked the fine detail I normally see on Blu-rays. This was most obvious in wider shots, as those looked a little soft. No issues with jagged edges or shimmering occurred, and I noticed no edge haloes or artifacts. Print flaws also remained absent. In terms of colors, the movie matched its title, as it opted for a low-key palette and a lot of darkness. Occasional instances of brighter hues appeared, but most of the film stayed with an earthy appearance. Within those constraints, the tones looked fine. Blacks were a little inky, and shadows tended to be a bit dense; low-light shots remained reasonably visible but weren’t particularly dynamic. Everything here worked well enough for a “B-“ but I wasn’t consistently impressed. At least the film’s DTS-HD MA 5.1 soundtrack offered more obvious pleasures. I expected pretty good involvement and activity from a sci-fi action-adventure, and I got it. While the movie lacked the consistent bombast of efforts like Independence Day or War of the Worlds, it still boasted a lot of material from all five channels. During action scenes, these blasted to life, and the quieter sequences demonstrated a nice sense of place and setting. The elements meshed together to create a vivid, engulfing setting. Audio quality worked well. Speech was crisp and distinctive, without edginess or other issues. Music seemed bold and full, while effects delivered nice clarity and impact. When necessary, the mix boasted terrific low-end response. All in all, this turned into an effective soundtrack that suited the material. When we head to the set’s extras, we launch with an audio commentary from director Chris Gorak. He offers a running, screen-specific look at sets and locations, cast and performances, various effects and visual elements, shooting 3D, how he came onto the project and aspects of its development, visual design, story/character areas, shooting in Russia, music and audio, and a few other production topics. Though a little spotty on occasion, Gorak usually provides a very good chat here. He touches on all the relevant subjects and does so in a lively manner. Gorak adds to our understanding of the film and creates a likable, informative piece. For a little more of the movie’s universe, we find a new short film entitled Survivors. It runs eight minutes, nine seconds and shows attempts to battle the aliens outside of Moscow. It’s somewhat fragmented but it’s a decent little action piece. We take a look behind the scenes with the Visualizing an Invasion featurette. 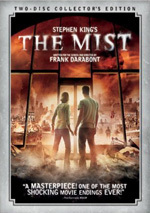 It goes for 12 minutes, nine seconds and offers info from Gorak, producer Tom Jacobson, executive producer Monnie Wills, visual effects consultant Stefen Fangmeier, visual effects supervisor Dmitry Tokoyakov, and actors Emile Hirsch, Joel Kinnaman, Rachael Taylor, Max Minghella, and Olivia Thirlby. The program discusses the movie’s visual design and its effects. In addition to the comments, we get background footage and elements like pre-viz animatics. “Visualizing” delivers a tight and informative little overview. Five Deleted and Extended Scenes occupy a total of four minutes, 48 seconds. We find “Anne and Natalie at the Airport”, “Skyler Brags to Tess”, “Ben and Vika Talk About Their Siblings”, “A Toast to the Fallen Comrades” and “Natalie and Sean Talk About Anne and Ben”. (Note that the first four are deleted sequences, while “Talk” is extended.) These tend to offer minor character expansions, such as an earlier introduction to Anne and Natalie. They’re essentially insubstantial and wouldn’t have added anything to the final product. We can view these scenes with or without commentary from Gorak. He gives us some basic notes about the sequences and sometimes – but not always - lets us know why he cut them. Don’t expect much from Gorak’s remarks, but he includes some decent thoughts. The disc opens with ads for Man on a Ledge and Gone. No trailer for Hour shows up here. Though it looked like it could’ve been a good take on the alien invasion theme, The Darkest Hour instead ends up as a fairly dull experience. It throws out a smattering of thrills but feels too derivative and stale to prosper. The Blu-ray comes with erratic visuals, very good audio and a generally useful set of supplements. If you’re a huge fan of the genre, you might want to give this one a look, but don’t expect much from it.